Ok, here is the situation – there is a lot of stuff to read on the net, especially regarding development, so I’m planning to do some posts about the stuff I find there. Do you comment out or delete the “bad” code: http://elegantcode.com/2010/06/06/the-best-code-you-will-ever-write/ ?" I’ve been testing random stuff on my Windows 7 x64 machine. One install required .Net framework 1.1, so I quickly installed it (despite the warnings), installed required software, which by itself didn’t depended on the .Net framework version and then – uninstalled .Net framework 1.1. 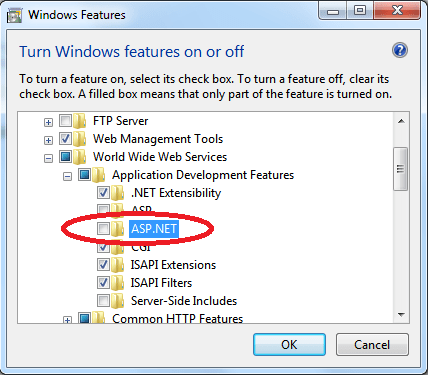 After performing these steps, some web services that are relying on the ASP.Net (in my case TFS Server 2010 beta) stopped working. When browsing to the web services (typical test for TFS availability) directly I got 404, which is somewhat strange, but often means ASP.Net registration problem. I’ve tried to run aspnet_regiis –i –enable, but got back 0x800700B message in the UI and 0x8004005 in the console. After binging for a while I found couple articles, but none related to this particular case, because I was dealing with the correct .Net framework version installed (comes as a part of OS). As you can see, ASP.Net was unchecked and as the result I was getting the error. Enabling ASP.Net there fixed the issue and services got back to normal. Ok, Windows 7 rocks. I mean it, really. It runs smoothly on my Asus EeePC netbook smoothly. Other features like pinning programs to taskbar, home group, snapping, live taskbar preview and other make live so nice and easy. As everybody now talks about cost and value, so I want to remind all folks that there is some stuff, which is not in the box, but adds cream to the pie. Many of us can run Windows without any antivirus and still have no fear of being infected by malicious software, but … if you want to have antivirus on your machine, it is pretty easy to have one. You can choose any provider you want, but I choose the one that has created OS. Yes, you can have free antimalware solution from Microsoft: Microsoft Security Essentials. Now if you have Canon HD camcorder like me, then you probably don’t need to look for codecs and software to view the movies anymore, because windows supports AVCHD format out of the box. But, if you want to edit movies to create home video, add photographs, create panorama pictures from the photographs you have taken, there is one more free toolset available: Windows Live Essentials. With the new movie maker you can easily create home movies from the HD source, save them as HD quality WMV and watch them either using Windows Media Center functionality or, if you’re even more lucky, directly by using “Play To” feature from Windows. Windows Live Essentials contains even more tools like messenger, mail or Windows Live Writer, which I’m using now to post this blog post. I know, it sounds a bit like a marketing, but it is so much simpler now for me to do these basic things at home so I just wanted to share. Microsoft has released Microsoft Security Essentials – a free software (requires genuine Windows) that guards against viruses, spyware, and other malicious software.